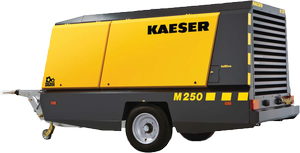 Kaeser Compressors' superior line of Mobilair portable air compressors are designed to pack the most efficieny possible into a compact, rugged design. They are exceptionally durable and are built to withstand even the most demanding job sites. Their superior German engineering means reliable performance year after year. Whether you rent or operate them, Mobilairs' long life mean they can spend more time out in the field earning you rent or getting jobs done. 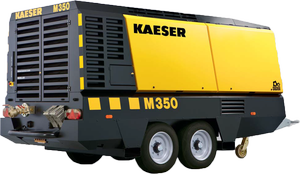 Kaeser Mobilair portable compressors are available in a wide range of sizes and pressures and are suited for many applications including (but not limited to) sandblasting, pavement breaking, and general air tool use. Their extensive options allo customization to meet virtually any demand. 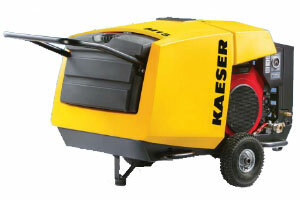 Units are ideal for rental houses, repair trucks, and municipalities. Each Mobilair features a heavy duty chassis and canopy design to provide excellent protection from corrosion and the elements. Units feature powerful, yet efficient engines from names you can trust: Honda Kubota, Deutz, and Mercedes Benz. The package air flow design keeps the motor cool, even under demanding conditions. Features like our cold start batter assure year round availability. 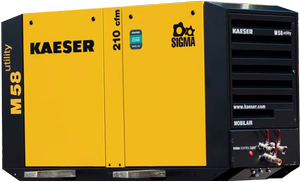 Mobilair compressors feature larger, slower turning Sigma Profile airends for longer life and better effiency with 15% - 20% more aiur per gallon of fuel than our competition. 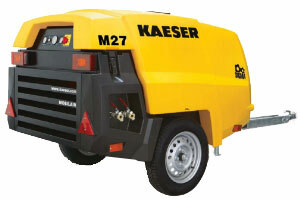 Superb reliability and simple mainenance save time and money. The patented Anti-frost Valve protects air tools from freezing when the ambiant temperature is lower, significantly increasing tool service life. Mobilair compressors are simple to iperate, provide excellent component accessibility, and are easy to maintain. Their enchanced safety features and cery low noise levels make them the perfect choice for any job site. 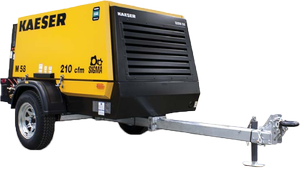 Towable models have excellent handling with even weight distribution and feature a torsion bar suspension system. Superior efficieny means you can run them longer before refueling. The smallest Mobilair compressors are more than capable of powering breakers, drills, saws, grinders, impact wrenches, and even impact borers. The higher pressure version is the ideal choice for fiber optic cable moles. In addition, the compressor can be equipped with an external compressed air aftercooler for certain applications that may require cool and condensate-free compressed air. Outlets 1 x 1⁄2" 1 x 1⁄2"
Outlets 2 x 3⁄4" 2 x 3⁄4"
Outlets 2 x 3⁄4", 1 x 1" 2 x 3⁄4", 1 x 1"
Outlets 3 x 3⁄4", 1 x 1-1⁄2" 3 x 3⁄4", 1 x 1½"
Outlets 3 x 3⁄4", 1 x 2" 2 x 1", 1 x 2-1⁄2"
Serving Construction and Mining Industries since 1987. Copyright ©2019 Crowder Supply Company, Inc.